This is a combat veteran’s account of his experiences as a gunner flying B-17’s over Europe in WWII. The fact that he is Jewish only adds to it’s allure. 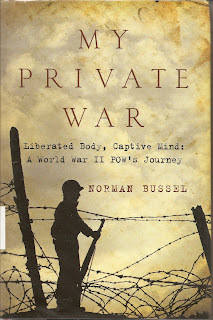 Quite simply put, this is one of the most engaging and personable war related memoirs I have ever read. It is 2 stories- the first being the typical account of a 17 year old from Memphis going off to war and his experiences in bootcamp and flight training and then into the European Theater, flying B-17's out of England. Short on braggadocio and long on personality, this book hooks you with stories of his friends and wartime buddies. You'll meet "Red" a guy who could find anything, anywhere. And "Old Joe" the German guard who time and again befreinds Mr. Bussel and his fellow captives. From his shootdown over Berlin in 1944 and beyond into captivity you will laugh with mirth and winch in pain as the story unfolds. Almost lynched by farmers, saved by his enemies, tormented by his captors and liberated by his comrades, this book is fast paced and alive with an energy all it's own. No subject is off limits in this witty memoir of a life turned upside down by the ravages of war and imprisonment beyond the gates of the prison itself. The second story is one of repressed memories and a struggle against anti-semitism, alcoholism, and Post Traumatic Stress before the phrase was coined. Stunningly honest in his assessment of his own lifes problems and drawing parallels with the Post Traumatic Stress Disorders of the present day, this book is more than a mere memoir. It is a valuable insight and learning tool into a subject that is still much misunderstood.